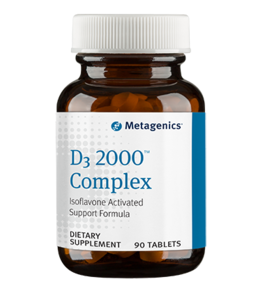 D3 2000™ Complex delivers 2000 IU of the preferred form of vitamin D, as vitamin D3, in each tablet. The inclusion of isoflavones may help facilitate the body's utilization of vitamin D3. Ingredients: Microcrystalline cellulose, soy isoflavones (soy), cholecalciferol, stearic acid (vegetable), sodium starch glycolate, and silica. Caution: If pregnant or nursing, taking other nutritional supplements or taking medication, consult your healthcare practitioner before use. This product contains vitamin D at the adult tolerable upper intake level, the maximum daily intake unlikely to result in adverse effects in the most sensitive individuals. Keep out of the reach of children. †Derived from non-genetically engineered, identity preserved soybeans.